Franklin City Hall is located at 109 3rd Avenue South, Franklin TN 37064; phone: 615-791-3217. Photo: William S. Campbell House, ca. 1840, Route 96, Franklin, TN. Listed on the National Register of Historic Places in 1975. Photographed by User:Skye Marthaler (own work), 2014, [cc-by-3.0 (creativecommons.org/licenses/by/3.0)], via Wikimedia Commons, accessed March, 2014. The seat of Williamson County (Franklin) is located in the center of the county. Franklin is adjacent to the Big Harpeth River in an area characterized by flat, undulating farmland. To the north of Franklin is similar undulating farmland broken up by hills and ridges. Despite the rapid development of the past twenty years many sections of Williamson County remain largely unchanged, especially in the southwest and southeast sections. In 1980, one-third of the county remained forested and there were 1,595 operating farms with the average size of each farm at 153 acres. Franklin has designated two large areas of the community historic districts and the retention and renovation of historic structures is an important part of community life. Williamson County is at a crossroads regarding the protection and preservation of its historic structures. The city and county planning agencies are seeking ways to retain the heritage of the county while accommodating new growth. After 1900, Franklin's population grew as new roads and railroads connected the town with Nashville and adjacent counties. From 1900 until 1940 most of the notable residential architecture built in these years took place in Franklin. Houses reflecting the Colonial Revival, Bungalow and English Tudor styles were built in the Hincheyville area and along Lewisburg Avenue. Most of these houses were built on small lots creating a dense and compact streetscape in the areas around the public square. There are no examples of the Art Deco or International Style in the residential areas of Franklin but some commercial buildings in the downtown area do have Art Deco inspired detailing. 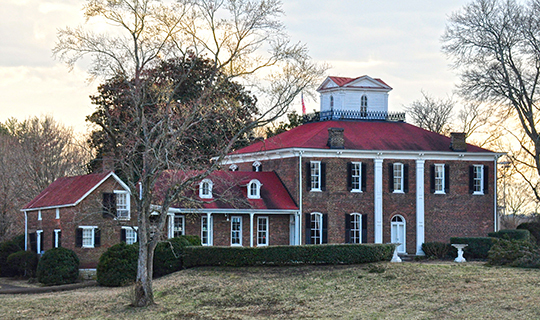 After 1940, the architecture of the county followed established national trends with many new subdivisions and tract housing built outside of Franklin and in Brentwood.